Recruitment of Junior Associates (Customer Support & Sales) in Clerical Cadre in State Bank of India (SBI) (Advertisement No. : CRPD/CR/2017-18/10) is recently out. According to the SBI Recruitment 2018,Applications are invited from Indian Citizens for recruitment of Junior Associates in Clerical Cadre in SBI. 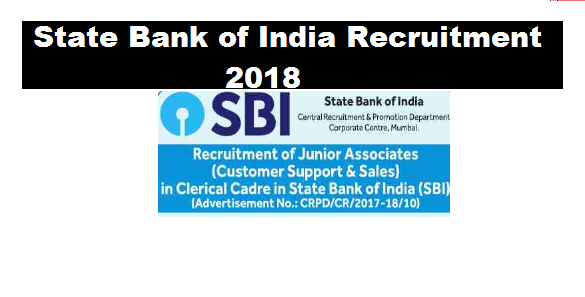 Following are the details of the posts under SBI Recruitment of Junior Associates (Customer Support & Sales) 2018 with post details, number of vacancies, age limit, salary, required qualification with application details.